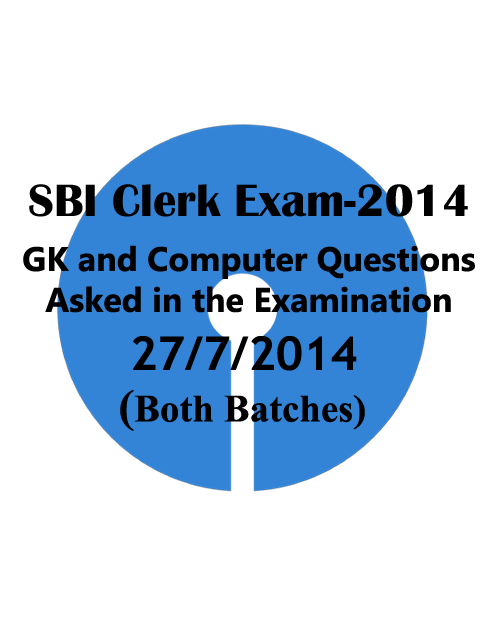 Questions Asked in SBI Clerk Online Examination 2014 held on 27/07/2014 (Both Batches). List of GK Computer questions asked in SBI Clerk Online Exam 2014 held on 27/07/2014 (Both Batches).Candidates those who are preparing for the examination can get idea from the questions below and candidates those have completed their exams can share your questions in the comment box below. Constituency of Nitin Gadkari was located at? Press Freedom day was celebrated on? World Tourism day was celebrated on? What is the name of financial inclusion committee? Who is the chairman of Bhartiya Mahila Bank? Vijay Sheshadri has won Pulitzer Prize for? Which place did PM has inaugurated New Hydro Power Plant recently? What is the official currency of Indonesia? What is the Missile launched recently by DRDO capacity of 150km? Who is the minster of social justice and empowerment? Which state doesn’t shares its borders with Telangana? Kavery river dispute was occurs between which two states? Who is the current Food and Consumer Affairs Minister? Which is the negotiable instrument? What is the aim of planning Commission? Gillette cup is related to which sports? Which of the following is Govt. Security Bond? For which bank account, bank is liable? World’s largest railway tunnel was located at? Which Banks has comes between NBFC? Which of the following is not used for payment? Which of the following is costlier in computer? MS Word is a type of? Aggressive market is due to? What are all the qualities of Good Sales person? What is more essential for successful marketing? Previous articleQuestions asked in 27/07/2014 Afternoon Batch | SBI Clerk Online Exam 2014.